We are specialist philatelic buyers and sellers of GB postage stamps to individuals and businesses. Excellent customer service is what we are about with super fast dispatch of orders. If you regularly use postage stamps and want to make big savings then we can help. All British decimal postage stamps issued by the Royal Mail from 1971 (start of decimal currency) to present day are legally valid to be used as postage so long as they have not already been through the postal network e.g. it is illegal to sell or use unfranked stamps which have already been used on letters and packages. We only purchase MINT decimal stamps from trusted and reliable sources therefore everything we sell is fully valid for postal use in the UK. We only sell stamps with full original gum sourced from stamp collections, professional stamp dealers and leading auction houses in the UK and Europe. We are well known in the Philatelic Trade and publish our GB postage buying prices in leading philatelic trade and stamp collecting publications, and on our website BUYING PRICES. We stock pretty much every decimal postage stamp the Royal Mail have ever issued. Values range from 1p to £10 and everything in between. However, not all of the stamps we buy are sold on as postage. We are now finding that a growing number of more recent stamp issues are becoming collectible, which is how it should be. As a result it is getting much harder to buy some of the more popular stamps and booklets at any discount to face value, especially when collectors are willing to pay a premium over face value. Collectible stamps can be found in our eBay Shop. 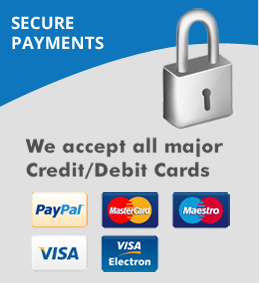 Payment by Credit/Debit Card, PayPal, Cheque or Bank Transfer with no surcharges.